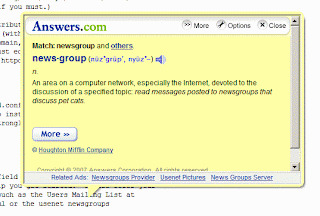 When you press enter, a new browser tab/window will be displayed and show you the word's Answers.com webpage. This is quite a bit faster than opening up a web browser, go to the homepage and Answers.com and type in the word there. Oh one interesting thing about Answers.com. You may be able to guess that it's a public company and yup you're right, its stock is traded on NASDAQ. But they only have 53 employees! (I don't know much about business and stock but I didn't know that company of that size can go public) And they're not doing well financially these two years... (If you're interested you can see their profile on Google Finance) Hope that they'll do fine soon and continue to provide excellent software and services!